Author of Niagara Falls, or Does It? It was a sad day in Willow Glen when Henry Winkler had to cancel his appearance at Hicklebee's last year. We're so glad he's recovered his voice and found time in his busy schedule to return, and extra glad that co-author Lin Oliver will be joining him. Join the fun! Thursday, January 29 at 7:00 The purchase of any Hank Zipzer title from Hicklebee's gains you entrance to the event. Space (& time) is limited! A Winkler/Oliver book purchased at Hicklebee's is your ticket in! (Each person must have at least one book.) After purchasing your book, be sure to reserve your *spot. *Priority will be given to those who purchased books last year hoping to see Mr. Winkler. Contact us by January 14th to be added to our priority list of attendees. Others purchasing books will be added to the list after that date. Winkler and Lin, writing for a younger (ages 6-8) audience, introduces HERE’S HANK. Here’s Hank stars the same Hank as in the bestselling Hank Zipzer series, only this time he's in 2nd grade. Hank is a kid who doesn't try to be funny, but he somehow always makes the kids in his class laugh. He's pretty bad at memorizing stuff, and spelling is his worst subject. (But so are math and reading!) In the first book in this new series, Hank's class is putting on a play, and Hank wants the lead part: Aqua Fly. But he freezes in his audition and can only buzz like a fly. His teacher creates a special part for Hank, a silent bookmark. This may seem like an insignificant role, but when his enemy, Nick McKelty, freezes during the performance, it's up to Hank to save the play! 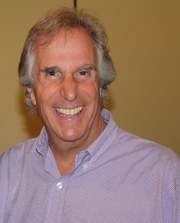 Henry Winkler is an accomplished actor, producer and director. In 2003, Henry added author to his list of achievements as he co-authored a series of children's books. Inspired by the true life experiences of Henry Winkler, whose undiagnosed dyslexia made him a classic childhood underachiever, the Hank Zipzer series is about the high-spirited and funny adventures of a boy with learning differences. Lin Oliver is a writer and producer of movies, books, and television series for children and families. She has written more than twenty-five novels for children, and one hundred episodes of television. She is cofounder and executive director of the Society of Children's Book Writers and Illustrators, and international organization of twenty thousand authors and illustrators of children's books. Please note that Mr. Winkler will only sign Hank Zipzer and Here's Hank books - please no memorabilia. Event guidelines. Browse Hank Zipzer titles here. Wow! Henry Winkler @ Hicklebee's! Winkler, writing for a younger (ages 6-8) audience, introduces HERE’S HANK. Here’s Hank stars the same Hank as in the bestselling Hank Zipzer series, only this time he's in 2nd grade. Hank is a kid who doesn't try to be funny, but he somehow always makes the kids in his class laugh. He's pretty bad at memorizing stuff, and spelling is his worst subject. (But so are math and reading!) In the first book in this new series, Hank's class is putting on a play, and Hank wants the lead part: Aqua Fly. But he freezes in his audition and can only buzz like a fly. His teacher creates a special part for Hank, a silent bookmark. This may seem like an insignificant role, but when his enemy, Nick McKelty, freezes during the performance, it's up to Hank to save the play! Books purchased at Hicklebee's has priority at our events. Check here for other event guidelines. Henry Winkler reads from A Brand-New Me!. Henry Winkler signs Hank Zipzer. Henry Winkler is currently considered a "single author." If one or more works are by a distinct, homonymous authors, go ahead and split the author. Henry Winkler is composed of 1 name.